I definitely like to eat like I have a little bit of every country in me – Mexican, Vietnamese, German, Italian, Spanish, Russian – I love it all! You know how some people plan trips to other countries and they’re focused on seeing the museums and monuments? I’m more focused on where are we going to eat? This summer, Rick and I are headed to Northern Italy, and while he’s totally in charge of all the sights that we’re going to see, I’m dead focused on the food and wine and cocktails – Give me all the handmade pasta, the delicate sauces, Negronis and glasses of Barbera… I am SO ready for this trip! 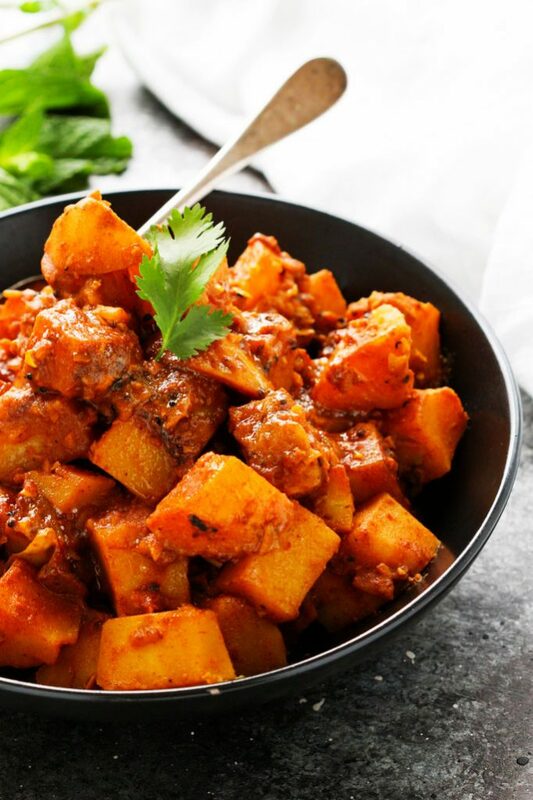 But today, I’m delving into a dish that (I think) is a bit out of my heritage – Potato Vindaloo. This dish is inspired from my childhood – Trips to the Indian food buffet with my vegetarian dad. I loved all the spices, the bright, bold colors, and the aromas that wafted throughout the restaurant – Curries and cinnamon and turmeric and cardamom and my favorite spice of all, cumin. Anything with an abundance of cumin is going to find its way straight to my heart. Most vindaloo recipes that you’ll find are for chicken vindaloo – A tomato based dish with a complex blend of spices which, very often, packs quite a bit of heat. I wanted to take that same dish, but turn it into a completely vegetarian meal – worth of my non- meat eating dad. There is definitely an abundance of spices going on in this dish – Luckily, I already had all of them on hand. But, if you’ve got a more modest spice cabinet, I highly suggest checking out the bulk section of your grocery store – It’s a good way to get just a little bit of a lot of different spices, for cheap. Cumin, coriander, turmeric, paprika and cinnamon all lend their bold color to the finished product – I mean, this dish is right in your face with those vibrant colors. The potatoes are almost dyed like little Easter eggs… Glowing in a bright orange hue. And, just like those potatoes absorb all those wonderful colors, they also absorb all of the intense flavors. Spice from the serrano pepper, tartness from the vinegar and a hint smokiness from the cumin. A sprinkle of cilantro and fresh mint brighten everything up at the end, and a dollop of Greek yogurt (or sour cream if you prefer) helps to tame down that heat just a little bit if you get a bite of it with each potato. A word of warning: Vindaloo is meant to pack a punch with its heat level. If you’d prefer a milder dish, be sure to seed that serrano pepper, and remove the ribs, or leave it out entirely. On a side note, this dish reheats beautifully, and it just gets better the longer it sits in the fridge (for up to three days). The flavors really get a chance to mesh all together and soak even further into those potatoes. I love making a big batch and taking it for lunches throughout the week. 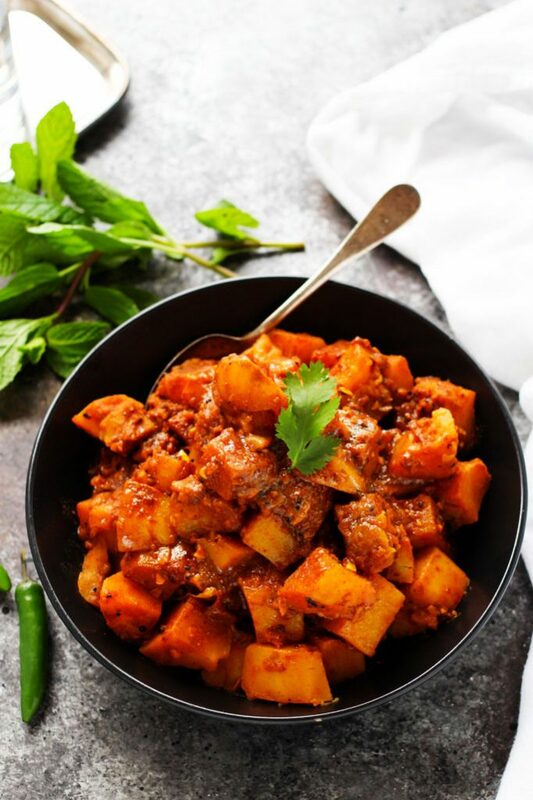 So, this Indian Potato Vindaloo is definitely a far cry from my Irish-Italian background, but I’ll happily add it to my food repertoire. Who doesn’t love a dish that’s packed with flavor, is perfect for both vegetarians and meat-eaters alike, and just gets better the longer it sits in the fridge? Winner, winner, chicken (free) dinner. In a small skillet over medium-high heat, toast the cumin, coriander and peppercorns until fragrant, about 1 minute. Transfer to a spice grinder or mortar and grind. Add tumeric, paprika, and cinnamon, set aside. In a large, deep skillet or dutch oven heat the oil over medium-high heat. Add the mustard seeds, shallots and serrano pepper with a pinch of salt and pepper and sautee until the shallots begin to brown, about 5 minutes. Add tomato paste, garlic, ginger and spice mixture and cook until fragrant, 2-3 minutes. Add potatoes, water, vinegar, brown sugar and a pinch of salt. Bring to a boil, reduce heat and let simmer 20-25 minutes, until the potatoes can be pierced with a fork easily. Remove lid and cook for an additional 5-10 minutes until the sauce has thickened. Serve with greek yogurt, cilantro and mint if desired. Ooh, that flavor combination sounds amazing. I agree those DNA kits are so interesting! That looks amazing. 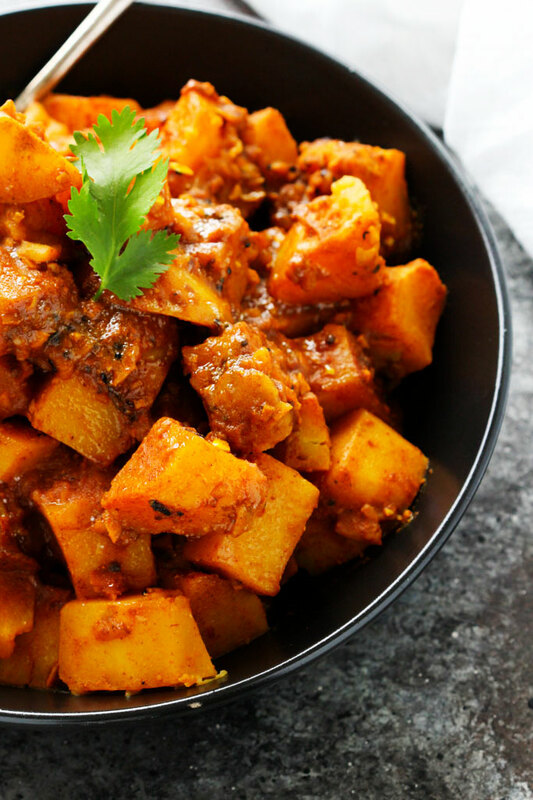 I’m obsessed with Indian Food and Vindaloo is my go-to! This looks delicious! I love Indian food but rarely make it at home. This recipe looks like a great place to start! This looks delicious and I’m sure smells even better. I love a good vindaloo, but usually go for lamb. Love the idea to use potatoes here! Thanks Ashley – I’ve never tried vindaloo with lamb, but it sounds fantastic – I love lamb! Wow! This was fantastic! We already had vindaloo spices and used 2 tbs instead of making the mix. My husband is vegetarian. We both loved this recipe and will make this again! Great recipe! It was amazing. My Husband is vegetarian and we both LOVED this. We have a vindaloo spice and used 2 Tbs in the mix. Turned out amazing.Thanks!! This turned out amazing! Thank you so much for sharing. My husband and I both loved it and will definitely be making it again. I’m so happy to hear that Mary! I made as written. I thought cider vinegar flavor was really overwhelming, and ruined the dish. Also, liquid never cooked down enough, resulting in a “saucy” finish, rather than dry. To me, it was barely edible. My adult kids disagreed and thought it was good. Cloves are mentioned in directions, but not in list of ingredients. This states 267 caloroes per serving but does not say how much a serving is.